A Trolley Bus for Parades is the ideal vehicle. We looked at many Trolleys before we acquired this one as it has an open back porch where people can stand and wave as the Trolley proceeds down the parade route. This would be ideal for the Parade Grand Marshal, a politician, a wedding couple or a Homecoming King and Queen.The windows are not tinted and go down so you can throw candy and beads out to the assembled crowds. The San francisco Trolley bus, fun, romantic and very special. 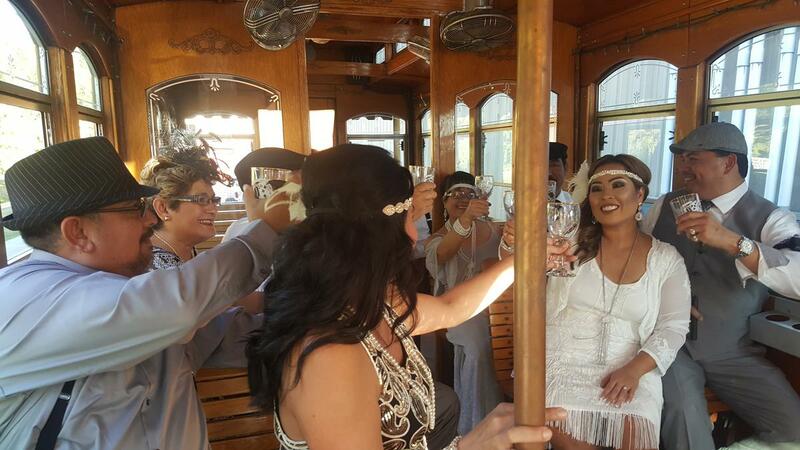 Brides and grooms- please check out all our reviews from other couples who really enjoyed using our antique cars and felt that it added a lot to making their wedding more special and romantic. Many brides have requested to see videos showing the inside and outside of our cars and are eager to know more about our policies and procedures to help them create a truly romantic and beautiful wedding. Please take a few mnutes to watch the videos below so you can have a much better grasp of who we are, what we do and how we can hlp you have a really "Wow Wedding"
I cannot thank you and Jordan Limo enough for making our wedding so special. The Princess was beautiful sitting in front of the chapel and also in front of the Cohen House. The driver was exceptionally kind, professional and accommodating. Doing business from start to finish with you was as enjoyable as the rest of the experience. Thank you for your flexibility and all the advice you offered along the way. As soon as we get some pictures back from the photographer, we will be sure to send them your way. Last Saturday was a beautiful evening, just perfect for the convertible. The couple had rented a mansion in River Oaks and had a large tent and a band. Afterwards, we did a slow ride through memorial park to the Omni Hotel. It was very romantic and the perfect getaway from a formal wedding.